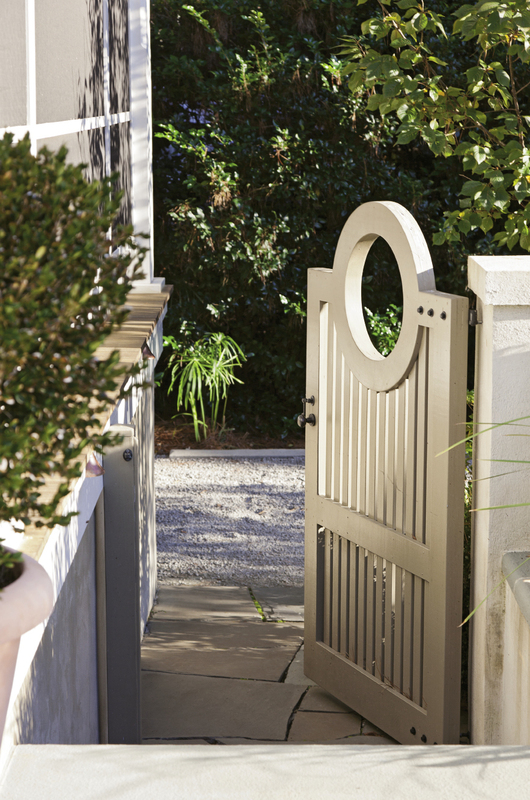 The back gate leads into a verdant haven in the Old Village, where a subtly dramatic garden awaits, including rows of undulating boxwoods and “hardy gardenia” azaleas. The lawn and pool area are seamless extensions of the house, which was designed by Dufford Young Architects. Green-leaf Japanese maples flank a door on the back garden wall, while a metal alligator adds a touch of poolside humor. Two porches along the back of the home overlook the personal haven. If every garden has its own story, this peaceful respite in Mount Pleasant’s Old Village is a tale of triumphs, both great and small. Driving by on Royall Avenue, you might not even know this quiet rectangle of sculpted green exists, which is exactly what the homeowners wanted—a private haven hidden from view. 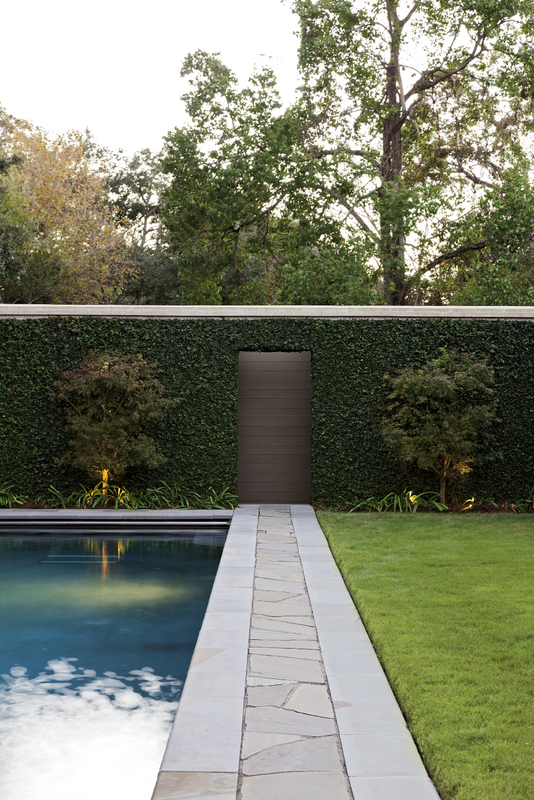 Originally a nondescript lot filled with weedy plants, a few diseased pecan trees, and a lightning-damaged magnolia, this patch of earth was deftly brought back to life by the vision of landscape architects Sheila Wertimer and Cindy Cline of Wertimer & Associates. The solution? The designers sculpted the land and altered the grade. Pilings were added to support the pool, and retaining walls artfully incorporated to build up the entire rectangular garden. Happily, this had the added advantage of bringing the garden area only a couple of steps down from the house, achieving the homeowners’ wish for a seamless transition from house to garden. 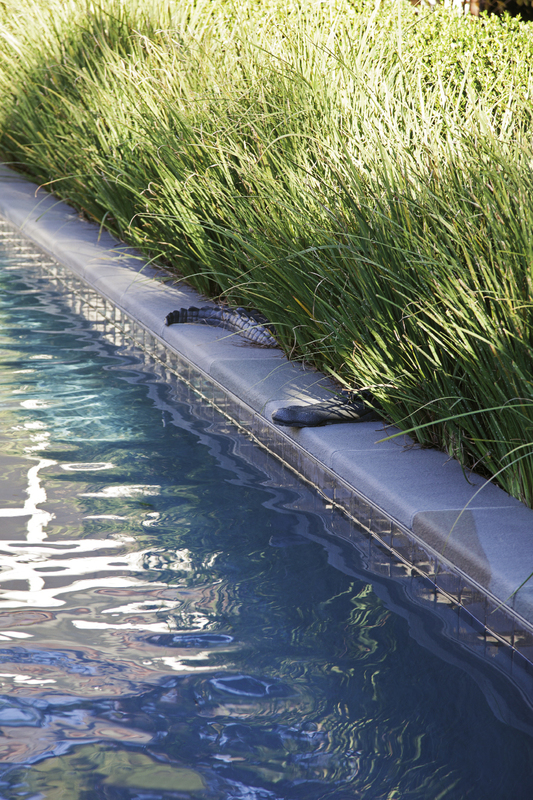 Though severe in its lines, the minimalist design has complexity and softness, through what Wertimer calls a “delicately nuanced planting plan.” Double rows of African irises fall delicately over one length of the pool, blooming from spring to fall and softening the hard edge. 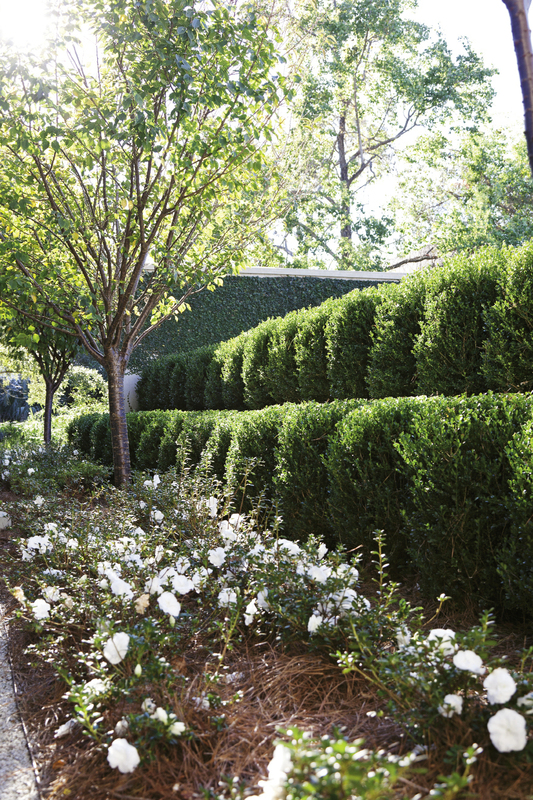 Behind them rises a double row of boxwoods, which are growing out of their formal ball shapes into a more fluid, undulating line. There are also papyrus, narcissus, and sweet autumn clematis; camellias, azaleas, and hydrangeas; a bevy of ferns and potted annuals strategically placed so that there is almost always something blooming, but in a quiet, subdued way. Inventory your lot and the architecture and note its advantages and constraints. 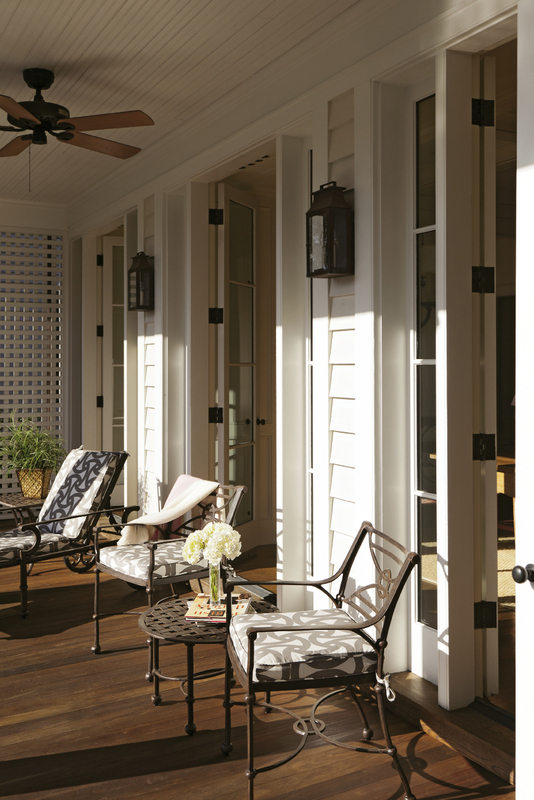 Approach your yard as an extension of the home and as a series of outdoor rooms to more easily envision how your garden should be divided. Think about how your garden might support daily life and interests. Those who cook may want a space for growing vegetables and herbs, while a love of entertaining might require more terrace space and seating. Consider how much maintenance you want to take on. This will dictate the extent of paved spaces, lawn areas, and plant beds as well as selections. Take visual cues from your house to influence forms and help cultivate a complementary palette of materials and patterns. Think about function and circulation. 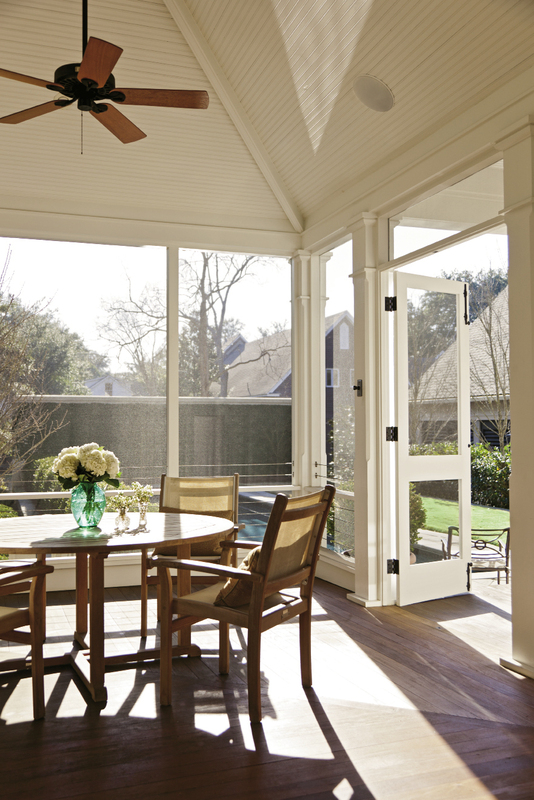 For example, the walk from street or driveway to front door should be easy to navigate, and a direct connection from the kitchen to your outdoor grilling space more convenient.